We can knit sweaters for oiled penguins, but it's harder to protect whales and dolphins from the harm of having us as neighbors. Loud underwater sounds from activities like sonar and drilling may damage these animals' hearing and even lead to mass strandings. Though we can't chase cetaceans around with homemade earmuffs, we might be able to teach them to tune us out. Like squinting or letting one's pupil shrink in bright light, some animals can adjust how sensitive their ears are. When we're making loud noises, humans reflexively squeeze the muscles of the middle ear to dampen our hearing. Some bats do the same thing while echolocating. "Generally speaking, mammals have evolved mechanisms to protect their auditory systems from self-produced intense sounds," write Paul Nachtigall of the University of Hawaii and Alexander Supin of the Russian Academy of Sciences. In 2008, the pair showed that a false killer whale (Pseudorca crassidens) could adjust its hearing while it echolocated. So they set out to see whether the species could also dial down its hearing in response to sounds made by someone else. They taught their whale (a female, originally caught in the wild and now thought to be 30 or 40 years old) that hearing a quiet warning sound meant a louder sound was coming soon. The subject wore suction-cup electrodes on her head during the experiment. Waiting at an underwater listening station, she first heard a series of tones while the electrodes measured which ones her ears responded to. Then, a variable amount of time later, she heard a sudden loud sound (170 decibels). Over hundreds of trials,* the researchers saw that the whale learned to anticipate the loud sound. If it came within 35 seconds of the warning sound starting, the whale was able to desensitize her ears before it played. (With a longer delay, her response wasn't as strong.) The authors report their results in the Journal of Experimental Biology. Nachtigall can't say how a whale turns down its hearing. 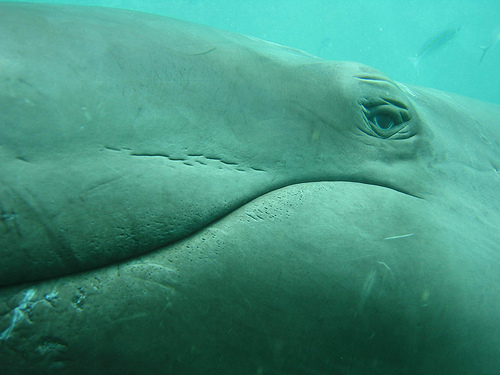 "No one knows for sure how the cetacean middle ear works," he says. Whales don't have eardrums like humans or other land animals, he says, because the sounds they hear must travel through tissue instead of air. So his whale subject probably doesn't squeeze her ear muscles to dampen sound, as a human or bat would. He speculates that it's more likely a top-down control from the brain. However she does it, the whale can make her ears less sensitive when she knows a loud sound is coming soon. The biggest decrease in her hearing sensitivity was about 13 decibels. That's "about what your hearing changes if you stick your fingers in your ears," Nachtigall says. If you—or the whale—are trying to protect your hearing from a loud noise, he says, "That helps. This would help." When humans must make a racket underwater, it's possible that we could help whales and other animals by making quieter warning sounds beforehand. This could teach the animals to anticipate the sound and "plug" their ears. Since he's only studied one animal so far, Nachtigall doesn't know how the abilities of other marine mammals to desensitize their ears compare. "To ask whether [warning sounds] would prevent whale hearing damage is sort of like asking whether ear plugs would prevent deafness in people who work next to jet engines," he says. "I believe the possibility is great, but there are more questions to be answered." *If you're wondering how one convinces a whale to participate in so many trials, the answer is "fish reinforcement." This seems to underestimate the whale's intelligence. A protective mechanism doesn't come into action solely when the whale is in an experimental chamber.... it's been there all along. Whales undoubtedly know when steadily noisy things like ships are nearby. Thus their cochlear feedback is already prepared for loud sounds. An exception might be a submarine that runs silently all the time and only rarely emits a loud sonar output or sets off a depth charge. In that case the warning sound would pretty much defeat the purpose of the submarine, because it would also warn the intended target.